“We are not immature, poor, backward people. We Africans have our own ideas about how to solve our own problems”, says Kenyan business woman Atia Yahya. The proof lays in her innovative ideas to create access to affordable healthcare for millions of her country folk. She sees fertile fields where others see dry savannas. Atia Yahya (1955) may be a sharp businesswoman but she is one with a big heart. The Kenyan consultant for medical insurances combines earning money with social justice. She will not any time soon label herself as a good doer. “I want to help my fellow Kenyans without making beggars out of them”, says Atia Yahya while cycling kilometres away on a home trainer in a gym in Nairobi. 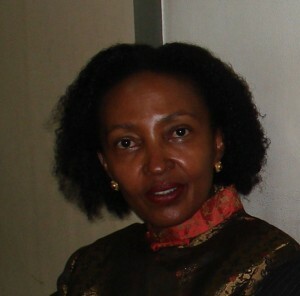 She was the first in East Africa who had the idea of insuring companies against HIV. “That idea was born out of the reality of HIV. Medicines were expensive and many people died because they could not afford ARV’s. Enterprises lost not only people but also expertise, also the insurance company where I then worked. I did not understand why other chronic diseases like diabetes or epilepsy were part of insurance packages but not HIV. Her idea for HIV insurance became an instant hit and big enterprises insured their staff against the infection disease. Other insurances followed suit. In Kenya, where half of the population lives below the poverty line of one euro a day, people die on a daily base of ordinary diseases like diarrhoea or malaria. Like in most other African countries Kenya has no real working National Health Service. Good medical care is offered in several hospitals but with a expensive price tag. Only companies or people with a good income can afford a health insurance. The market for insurance businesses in Kenya is small. Of the more than 38 million Kenyans only two millions are insured. This injustice made Atia Yahya think. “I realised that an insurance which brings only a small profit is still very profitable when I can make use of a potential of millions”. That thought created the idea for Changamka, an insurance for primary health care for the lower middle class. A smart card of 50 eurocent is connected to it. One visit to the doctor, tests and medicine cost a Changamka (up lifting) policy holder 4,50 euro per one go. The new insurance is targeting some ten million people who can put aside a little bit of money now and again to load their smart card for the day someone gets sick. De insurance not only covers the holder of the card but can be used by others as well. “Family, friends, acquaintances and neighbours can make use of it. Employers get the smart card for when employees fall sick”, explains Atia Yahya. Insurance company General Accident has signed contracts with hospitals where for little money good medical care is offered. The smart card is for the time being only operational in de capital Nairobi and other big towns. But expansion to rural areas is expected in 2011. Surrounding countries have shown interest in the new kind of insurance. Again praise is showered within the health sector on the innovative idea of Atia Yahya. “From head to toe a business woman”, qualify her business contacts her. Companies where she worked saw to their satisfaction their profit rising partly thanks to her ideas. “A manager who demands a lot of herself as much of her employees”, remarks someone who worked for her. But not only religion formed her attitude. She points out how social motivation is an integral part of African tradition. In Kenya so called Harambees are almost daily events. Those are meetings where money is being collected for a wedding party, school fees, an operation in a hospital or study fees for an intelligent young man or woman who wants to attend a university abroad. “Africa might be at the receiving end of foreign aid but Africans help each other as well. Maybe not an unknown person, thousands of kilometres away but they help someone in the village, in the school or within the family”, remarks Atia Yahya. “That was instilled in me from my early childhood”. The business woman climbed slowly but surely the career ladder within the insurance business. With the growth in career came the growth of the bank account. She got a reputation and fame and she was asked for the Rotary. Within that organisation she helped to establish scores of projects for the less fortunate in society. Atia Yahya is interested in healthy food and a loyal visitor of a gym. She intends to grow old in a healthy body. In the gym she hears on a regular base about private initiatives to improve the lives of ordinary Kenyans. I once told her of an encounter with a very regular woman who had taken in a dozen orphans in her home with no outside help. Atia Yahya wanted the phone number. After a few weeks she could tell me that the Rotary, on her advice, had provided the un-official orphanage with basic essentials like beddings and clothing. Rotary also made sure that an international organisation put a substantial amount of money in a bank account. The woman, who established the orphanage, could run the place of the interest of the lump sum. “That woman did not beg. She did it herself. That kind of initiatives deserve help”, Atia Yahya concludes. In 1997 a group of people amongst them Atia Yahya created the Kenyan Community Development Foundation (KCDF). “We believed that too much was lost in the efforts to help communities in Kenya. Seldom people were asked what they wanted and what they thought of a project. They got aid more or less imposed on them by foreign aid organisations. One year women were a popular target within the international aid community, the year after it was agriculture and then again children or handicapped. The well intended ideas from abroad ignored the culture and the ideas of local communities. Quite a number of projects ended prematurely or faltered after a while without any results”, says Atia Yahay who was elected recently to chair the KCDF. She hates begging. She believes in development via business deals instead of holding up a hand. “As KCDF we are also pragmatic”, she chuckles. “We rent ourselves to do for instance the administration of a project established by a foreign development organisation. With the proceeds we finance our own projects which come from dreams and ideas of our people”. One such KCDF project is around Isiolo, a dry area some three hundred kilometres north of Nairobi. A group of farmers wanted to grow vegetables in greenhouses. The local nomads laughed and no organisation was ready to invest in the idea. “The people behind the project were not only enthusiastic but also had a good plan en done extensive research. After our own assessment we could only endorse their idea and gave them starting capital”, says Atia Yahya. “You should see the fabulous vegetables that are now on the market in Isiolo. A foreign organisation would not have quickly gotten into a project to grow tomatoes on the savannah”. Atia Yahay belives time has come that Africa should be taken serious by the rest of the world and that Africans should get more self confidence. “We are not an immature, poor, backward people. We have our own ideas about how to solve our problems. Maybe with some foreign financing but preferable in the form of a business deal”.